Among the many steps of the keyword research process, the keyword brainstorming phase is just as crucial as any of the other steps. You can find new keywords with decent average monthly searches with low CPC that you can target. You can get new ideas for your blog posts. You can uncover new directions to develop for your business. You’ll have a better understanding of your niche. You can find new, yet overlapping markets to pursue. You can create your website’s silo structure. With these benefits in mind, business owners should never skip the process of brainstorming for new keywords despite how tedious or mundane they might find the task to be. Our Keyword Brainstorming tool makes the whole process of finding new keywords a lot painless and simpler for our users. After they type in their keyword, they literally just need to make a couple of clicks to get their keyword ideas. Here’s how our Keyword Brainstorming tool works. We designed our dashboard in a way that our users won’t have a hard time figuring out what to do next when on the web page. Looking at the screenshot above, you can see that our dashboard only has two elements in it: The empty search box where the users can type in their keywords for brainstorming, and the “Recent Brainstorms” section where our users can see the keyword phrases that they entered, the Created Date, the Keyword Count, and the “Actions” section where our users can view the specifics of their saved keywords, or delete the keyword. After our users type in their keywords in the search box, the search results page will then appear. This is our results page. As you can see, the keywords are neatly organized, and the page looks crisp and clean. There is nothing that makes the page distracting or confusing that can possibly overwhelm our users. 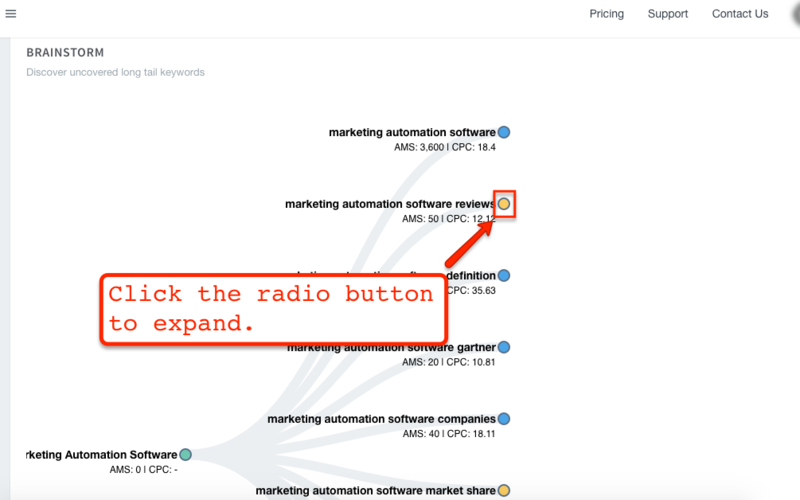 If the users want to expand the graph to view more keywords, they just need to click the radio button. Otherwise, the keywords won’t expand. 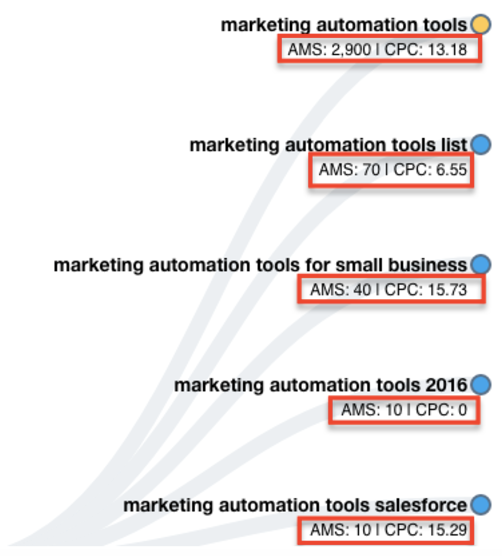 In addition to the keywords, the only other thing they’ll see are the Average Monthly Searches (AMS) and the keywords Cost per Click (CPC) — both of which are crucial when determining whether it’s feasible to target a keyword or not. If you like the set of keywords that you saw in our brainstorming tool, then you can save the keyword so you can get back to it and use it as a reference for your keyword research. Once the keyword is saved, you can then see the keyword in the dashboard. Also, clicking the keyword (not the radio button) will show a confirmation message from our system telling you that you will leave the tool and start a keyword research project based on the keyword you selected. If you’ll click the “Yes” button, you will then be taken to the Keyword Research tool to gain more insight about the keyword. Click this link so you can check out our tutorial on how to use our Keyword Research tool. If you’re looking for a reliable keyword brainstorming tool that gets the job done, all without overwhelming you with unnecessary functions or features, then visit our website now and signup for our software’s free trial.